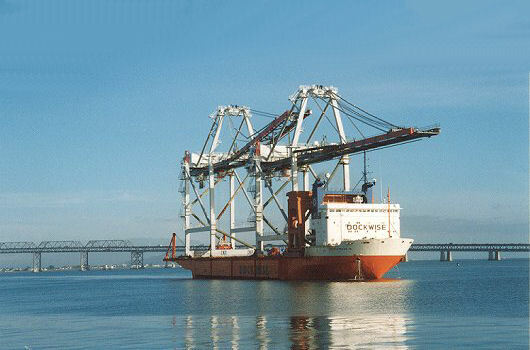 In June 1999, the Dock Express 10 delivered one each 4-th generation container crane to the Trans Pacific Container Service Corporation terminals in Oakland, CA and Los Angeles, CA, respectively. The cranes were built by Mitsui Engineering & Shipbuilding Co., Ltd. in Japan and Dockwise Shipping BV was contracted for the delivery. These cranes were transported together, fully erect, with the boom of the aft Oakland crane supported on the APEX of the forward Los Angeles crane. Argonautics Marine Engineering, Inc. was hired to supervise the offloading operations. The Oakland crane was offloaded, using the so-called "Miami" method offloading. After removal of the boom supports and tie downs, the 1,000 t crane was skidded aft over the ship's outriggers until the crane's landside sill beam could be lowered onto a set of jack boogies, which moved the crane further over the quay. Once in position, the waterside sill beam was temporarily supported on wood blocks. The landside was then jacked up for installation of the landside trucks. The ship was then moved forward, the waterside was picked up so that the waterside trucks could be rotated after which the waterside trucks were lowered onto the rails. After reloading of the offloading equipment, the DOCK EXPRESS 10 sailed to Los Angeles for delivery of the second crane. Because of the height restriction of the Vincent Thomas bridge, the crane was stowed inside the cargo hold as low as possible. The bridge passage even required this hold to be partly filled with ballast water to increase the vessel's draft as much as possible. The 1,000 t crane was offloaded by skidding it aft over the outriggers and landing it on wood blocks on the quay. In two steps, the crane was lifted higher after which the trucks could be installed. Provision of on-site supervision during offloading operations.